(Nanowerk News) A new study of thermonuclear X-ray bursts on neutron stars reveals that, on very rare occasions, shells can be expelled at relativistic speeds - up to 30 percent of the speed of light. These velocities are the highest ever measured for a cosmic thermonuclear event, including novae and thermonuclear supernovae. This phenomenon, discovered in only 0.1 second worth of data in 40 years of space-based X-ray astronomy, sheds new light on how nuclear flames spread over surfaces of neutron stars. The study was published by authors at the Georgia Institute of Technnology, SRON Netherlands Institute for Space Research and Anton Pannekoek Institute of the University of Amsterdam ("Relativistic outflow from two thermonuclear shell flashes on neutron stars"). 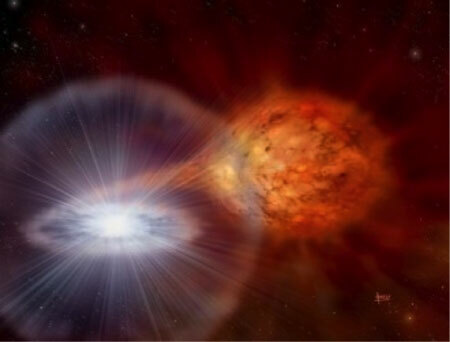 Artist impression by David A. Hardy of a binary system where a compact object such as a neutron star is accreting hydrogen and/or helium from a companion sun-like star through a so-called accretion disk. For a neutron star, this frame captures the situation about one second after a thermonuclear shell flash. A shell was blown off at relativistic speed and is just becoming transparent. In our galaxy, there are about 100 neutron stars that regularly burst in X-rays. When another star happens to be in the neighborhood of the neutron star, it may lose some of its hydrogen/helium atmosphere to it. This material on the surface of the neutron star subsequently ignites a thermonuclear runaway reaction resulting in a minutes-long X-ray burst. The bursts are so luminous that they are easily visible from anywhere in the galaxy, provided an X-ray detector is used in space because X-rays cannot penetrate the Earth’s atmosphere. X-ray bursts do not usually result in explosions. Gravity is so strong on the neutron star that any debris is firmly held tight to the surface. Only when a burst is powerful enough (in 20 percent of all cases), the pressure exerted by the radiation may be able to compensate for gravity. In such a case, the atmosphere is briefly lifted off the star and then pulled back again. The new study has now identified two bursts, out of more than 10,000 thus far detected, that are so powerful that a shell, visible for only a few tens of milliseconds, is flung loose from the star at 10 percent to 30 percent the speed of light. Georgia Tech physics postdoctoral researcher Laurens Keek is a secondary author on the paper. He says the two explosions were powered by helium fusion. “Helium burning produces a tiny amount of hydrogen,” he added. “This acts as a catalyst, and our computer simulations show that nuclear burning speeds up more than 100 thousand times. It takes detailed knowledge of nuclear reactions to explain how these X-ray bursts could set the speed record." "The found bulk velocities are a record for nuclear-powered phenomena," says SRON researcher, a primary author, Jean in 't Zand. "They are faster than the maxima measured in other stellar nuclear explosions (novae and type Ia supernovae). Presumably X-ray bursts provide us a window to the initial phase of thermonuclear runaways which is not available for (super)novae, since those are always discovered after that phase is over." The exceptional outflows seen in these two bursts go hand in hand with very fast ignitions of the complete neutron star surface – within less than 1 millisecond. In 't Zand: “This is very quick. It means that the nuclear flame spreads across the neutron star at velocities close to 0.1 times the speed of light. This puts interesting constraints on the theory of ignition and how the nuclear reaction chain works. Normal flame propagation mechanisms may not be viable in this regime. Instead, the neutron star atmosphere may be ignited in a so-called auto-ignition regime. In any case, this observational result is expected to stimulate new theoretical work." One can imagine a neutron star as a failed black hole. Both are remnants of stars at least a few times heavier than the sun, collapsed during a supernova after exhaustion of the nuclear fuel that kept them shining. Neutron stars are lighter than black holes, which makes them capable of making a full stop of the collapse just short of vanishing behind the event horizon, at a diameter of merely a few tens of kilometers. This implies that they have visible surfaces with unparalleled strong gravity, some 10,000 billion times stronger than on Earth. Throwing matter at it has a dramatic effect. That matter quickly piles up in a 1 m thick layer with such high pressures that a stellar sized H-bomb, powered by thermonuclear fusion, is ignited. The fusion lasts a fraction of a second and heats up the atmosphere to tens of millions of degrees. The subsequent cooling is visible as a minutes-long X-ray burst. The X-ray burst phenomenon was first discovered at SRON in 1975, with the first satellite built in the Netherlands (ANS). The measurements for the present study were carried out with NASA's Rossi X-ray Timing Explorer.